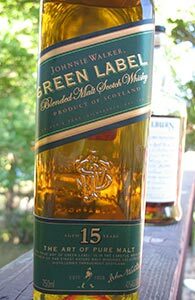 Unlike the better known Red, Black and Blue Labels, Johnnie Walker Green is a vatting of four malt whiskies, with no grain whisky in the mix. The malts come from four of Diageo’s distilleries: Talisker, Caol Ila, Linkwood and Cragganmore. Each malt in the vatting is at least 15 years old but the proportions are unknown (at least to me). The Green Label has now been discontinued as sales were apparently consistently poor. Though quite reasonably priced for 15 yo malt whisky ($55-60 in most parts of the US) it probably suffered from being in a sort of grey zone: too expensive for blend drinkers more likely to be drawn to the Johnnie Walker name in the case of the Red and the Black; not luxe enough to be the corporate/special gift that the Blue often seems to be purchased to be; and too Johnnie Walker for most people who spend that kind of money on malt whisky. It’s also probably the case that Diageo would rather find other, more lucrative uses for 15 yo malt. It’s still quite widely available in the US, however, and I’d recommend giving it a try before it disappears. Nose: Grassy and malty and peppery at first. Then expanding sweetness: first floral and the some fruit (pears and apples), and then some vanilla and cream; with time the fruit turns a little musky. Remains quite malty throughout. I’m looking hard for the Caol Ila smoke but not finding it. Water doesn’t bring it out either (maybe they used the unpeated “Highland” variant?). Palate: Well, there it is on the palate, which opens with light peppery smoke (could be from the Talisker, I suppose) and transitions quickly into malty sweetness. With the second sip the smoke hangs around a little longer and there’s also more brine and chalky/limestoney notes and just a bit of lemon. With more time it’s the fruit that’s the main player—some lemon, some melon, maybe some grapefruit. Water revives the pepper and smoke and brings out more of the mineral notes (Caol Ila). With more time the sweet/musky fruit returns. Finish: Quite long. The malty sweetness transitions into some salt and then some mild woody notes. Water extends the musky sweetness and brings some smoke into the finish as well. Comments: This takes a while to get going but is really quite nice. If it were released by Compass Box whisky geeks would probably love it even more. Very well balanced—testament to the blender’s art.